Was it really this easy to start a mob rampage in the ’40s? I’ve been watching the “Universal Monsters” movies on TV lately. It’s a Mystery Science Theater 3000-like comedy show called “Svengoolie“, but for the most part the comic interruptions do little to either enhance or detract from the film. It is rather amusing how all the movies follow the same basic templates, but it kind of makes sense once you remember these movies were made in the 1930s and ’40s and it must have been a treat just to get to see a movie, even if it was almost the same as the previous movie. People were probably less critical of movies then. It’s also hilarious how often a torch-wielding mob shows up in these flicks. There’s a scene in The Mummy’s Tomb where the Sheriff or somebody says to the assembled townspeople: “You’re not gonna believe this, but there’s a 3000 year-old monster on the loose. We’ve got to run him down.” (Close paraphrase.) The next scene is a mob of people marching to the cemetery with torches, on the grounds that somebody saw an Egyptian guy there the other day. 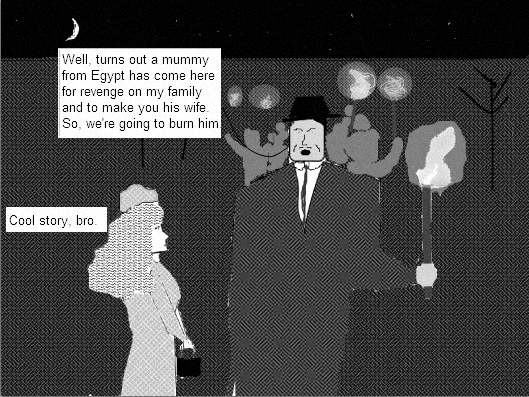 I never liked the Mummy movies; he moves hilariously slow. And the plot is just too sloppy and incoherent, even by horror movie standards. The only Mummy movie I ever liked was the 1999 one, which wasn’t even a horror movie, but a very amusing action-adventure. Now, the Dracula movies were much better, even if they were also very predictable. But Dracula seemed like a dangerous monster, what with the turning into a bat and a wolf and magically opening locked doors and whatnot. One other note: The Mummy’s Tomb has a character in it who looks exactly like Ron Paul. At least, I thought he did. (I admit I tend to see resemblances to people in movie characters very often, and my fellow viewers don’t know what I’m talking about. It’s like the TMBG song “Certain People I Could Name“.) That was perhaps the most frightening thing in the whole movie. The actor’s name, by the way, was Otto Hoffman. Prev Post: The Return of Funny Spam Comments!